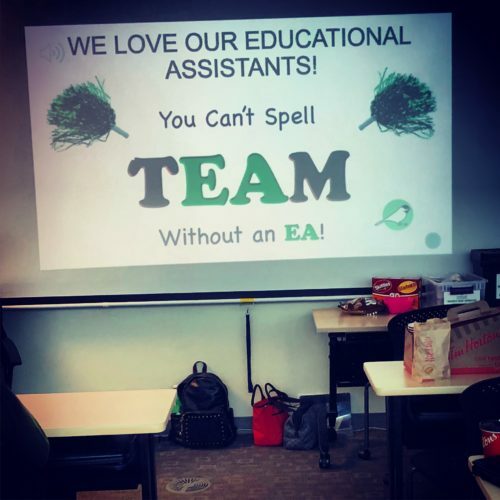 We’ve been focusing on training communication partners recently and today we’re focusing specifically on paraprofessionals/educational assistants. 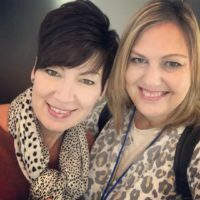 Our guest post is authored by SLPs Corinna Duffitt, M.Sc., RSLP (practicing for 21 years, 14 years in AAC) and Jennifer Wiegert, M.A., CCC-RSLP (practicing for 21 years, focusing on AAC for the past 6 years). They are colleagues on an AAC team with 4 other SLPs in a large school district in Surrey, BC, Canada. Their school district consists of 101 elementary schools and 20 secondary schools. Corinna and Jennifer are both passionate about giving children a voice and letting that voice uncovers their potential. They recently joined their private practice endeavours, outside of their public school positions, to form Chickadee AAC Communication Services. You can find them on Instagram (@chickadeeaacslps or #chickadeeaac), check in on their website, and/or follow them on Facebook. 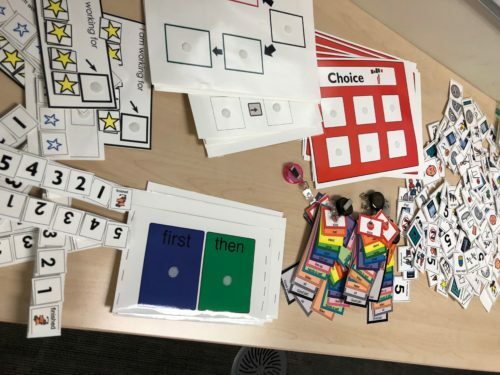 A standard set of visual supports and schedules across the school district (verbal direction ring, first/then pocket, countdown strip, and visual schedule) so that the picture symbols and strategies used with students are consistent across all environments by all support staff. All staff attends training in proper implementation. We present AAC workshops for Educational Assistants and Integration Support Teachers during almost every pro-D day across the district. These workshops focus on the basics of AAC, programming, implementation strategies, adapting materials, and planning for AAC across the day. After attending the Roll Out the Core presentation by Kelly Key and Deidre Dobbels at Closing the Gap 2015, our department implemented a Word of the Week program district-wide. This provides our EAs with specific and manageable goals to focus on while supporting students who have AAC systems. In our private practice role with Chickadee AAC, we began to explore Educational Assistant programs in some local colleges. We learned that some programs offered AAC as part of an AT module – however they were not taught by an SLP with experience in AAC or the content was not up to date with best practice. We felt that this had to change. Outside of their families, the students often spend most of their time with educational assistants. The EAs are often with the students for 6 hours, 5 days a week – that’s a lot of time for modeling! What if we could train the EAs in the area of AAC? We approached several colleges and outlined a program that we thought would target all of our areas of concern. 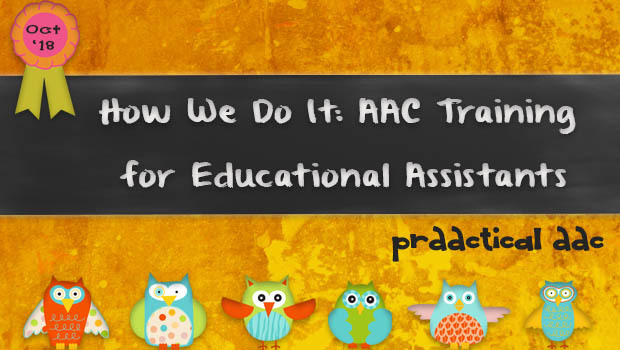 After some discussion, we developed an AAC module for Educational Assistant students at two different colleges. We provide the instruction, which includes a combination of lecture, homework assignments, and hands-on activities using visual supports and AAC devices. Our current AAC modules are 12 hours and 20 hours long with between 25-60 students per cohort. What have we included in our AAC module for Educational Assistants? 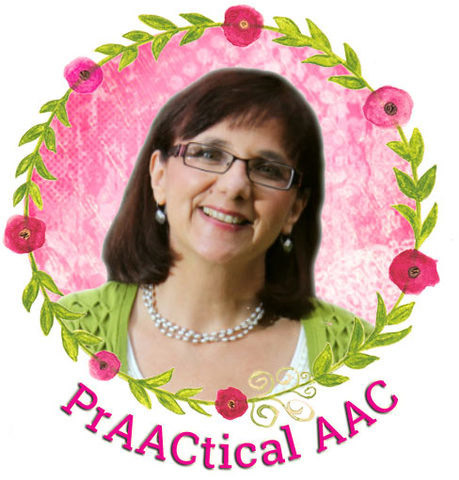 To begin with, a general overview of AAC! We define speech, language, and communication. Our students walk away with an understanding of receptive and expressive language. They also get hands-on practice with eye gaze boards, PECS, communication books, and PODD. 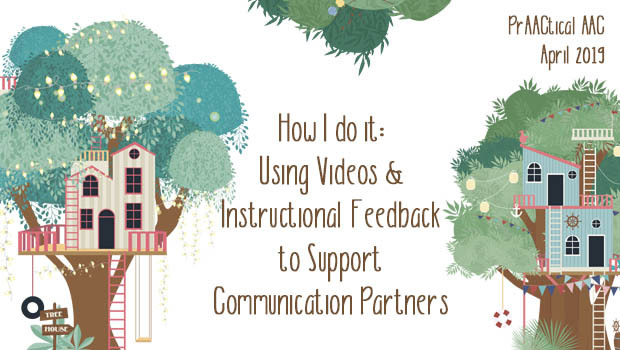 Our presentation is rich with videos of each of these approaches. High tech devices and apps are discussed. Students have the opportunity to compare various vocabularies as they navigate through them on a class set of iPads, answering questions regarding core words, robust vocabulary, sentence generation, and so forth. Implementation strategies are discussed, with much emphasis on Aided Language Stimulation. 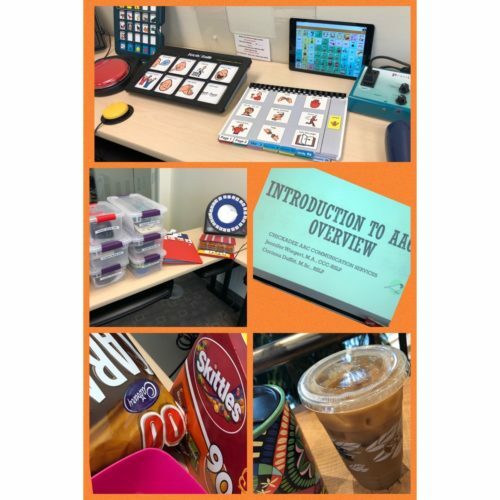 Using Saltillo’s “Choosing Core Vocabulary: Activity First Approach” and given a variety of toys and materials (bubbles, math activities, art supplies, circle time, etc.) the students generate words to model for their given activity. Then using iPads with a communication app, they practice modeling the language to each other, using the various materials and books provided. Students are encouraged to think of ways to sabotage their students, add language, and practice expectant pause! They enjoy these activities, and we enjoy watching their skills emerge! We spend some time talking about and looking at various adapted materials. Students have to complete one assignment in which they adapt a book, activity, or other material to accommodate a given student profile. We discuss barriers to communication. Interpersonal Scenarios, created by us based on situations we have encountered with teams and team members in our schools, are one of our students’ favourite group discussion activities! We always end our course with an afternoon of sharing, wherein the students present their “student” and adapted materials to both instructors and classmates. 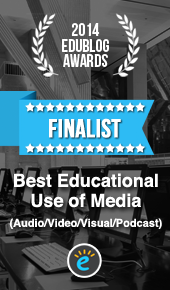 Robust vocabulary – Based on our experiences working with EAs throughout the school district, we have realized that we are most successful with “buy in’ when the EAs understand ‘why”. If they understand the reasons for the strategies we are asking them to implement, they are much more likely to follow through. We teach the EAs that we provide our students with a “Robust Vocabulary” based on Kate Ahern’s definition. Teaching students from a language-based perspective – We teach them the manner in which AAC user’s develop language, and what strategies are required to facilitate communication progress. 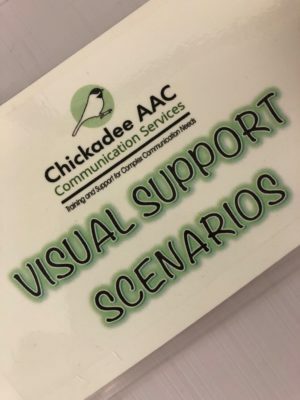 Refer to the table “Look Through a Language Development Lens to Set Expectations and Guide Intervention for AAC Users” by Chickadee AAC. Presuming Competence – We teach them to understand the difference between giving the students directions/instruction and the students “having a voice”. We want the Easy to understand that appearances can be deceiving, that we must presume competence and assume that each child has a story to tell and a mind to share, and each deserves the right to grow and flourish into an independent adult with a purpose in life! 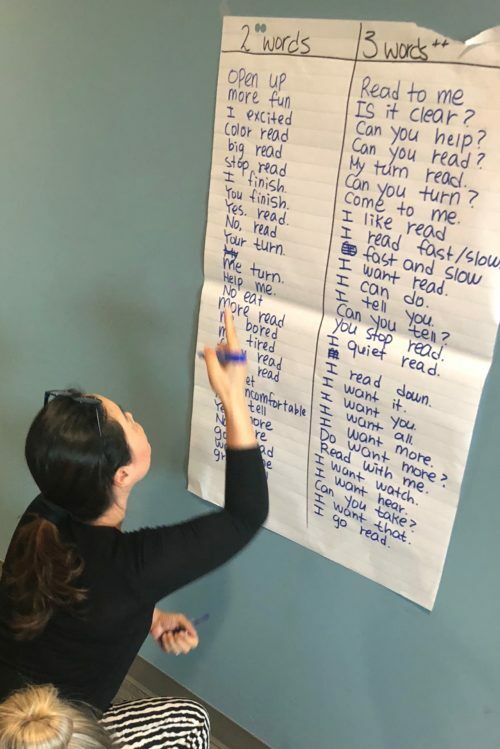 We encourage them to think of long-term goals when working with their students: it might seem like they can’t do a lot when you first start out, but with consistency and practice they will become advocates for themselves and lead fuller lives with community connections and relationships. It’s very good that you are teaching EAs about AAC, it is very useful. My son attends an elementary school in Surrey school and the EAs are struggling to help him with his communication on his iPad. It would be wonderful if you can provide some training workshop for parents. As a parent I spend a lot of time with him and have learnt how to use his Proloquo2go but still there is so much more I can learn to help him.